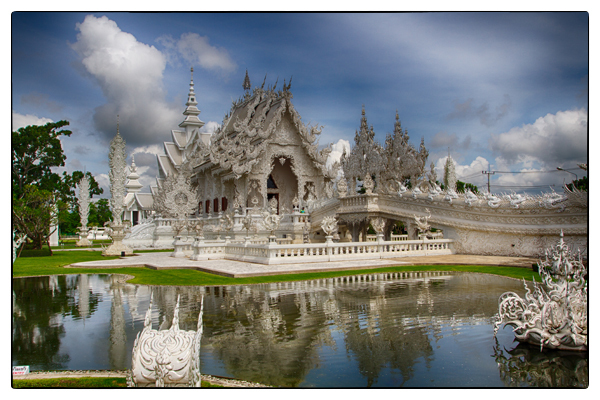 The amusement park-like White Temple in Chiang Rai, Thailand. Photos by David Lansing. Yesterday we’re at the Black House (Baan Dam) in Chiang Rai. Today we’re at the White Temple (Wat Rong Khun), which is just as bizarre. No, it’s more bizarre. So the old monk said, Why not? 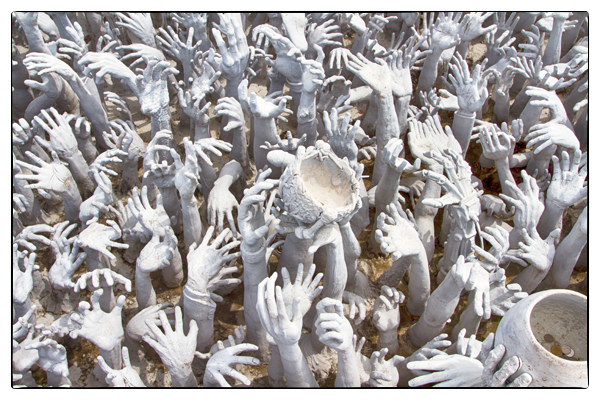 True to his word, Kositpipat has turned the White Temple, or Wat Rong Khun, in to one of the most visited temples in Northern Thailand and, in so doing, is now known as The Gaudi of Thailand. Frankly, I don’t see so much of Barcelona’s Sagrada Familia in the White Temple as I do a Salvadore Dali or even William Blake. The White Temple is a sculptural allegory. The stark whiteness stands for the purity of Buddhism, the blinding mirrored glass for Buddha’s enlightenment. A bridge over a river of pain separates hell (with thousands of clay hands trying to drag you down) from heaven (the temple itself). Inside are murals that, in addition to showing traditional Buddhist images, show the great battle between good and evil as being fought by Superman, Batman, Bin Laden, McDonald’s, and even George Bush. Did I say the temple was bizarre? You either like this sort of thing or you don’t. Frankly, I didn’t. To me, it reduces the ancient knowledge of Buddhism into a comic book with Star Wars’ heroes fighting beside Buddha to save your soul. I don’t think it’s irreligious—just silly. Hands from hell reach out to you as you cross the bridge to the White Temple. Photo by David Lansing. 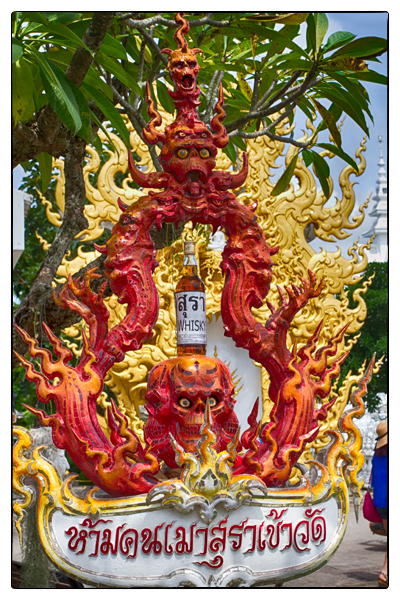 Demons near the entrance depict the sinful addiction of alcohol to reaching the temple. Photo by David Lansing.